Hawaiʻi residents may face snow, flash flooding and landslides as a plume of deep tropical moisture is expected to surge northward to Hawaiʻi this week that will provide the fuel for heavier and more frequent downpours for some of the islands. Hawaiʻi residents and vacationers will need to be on alert. 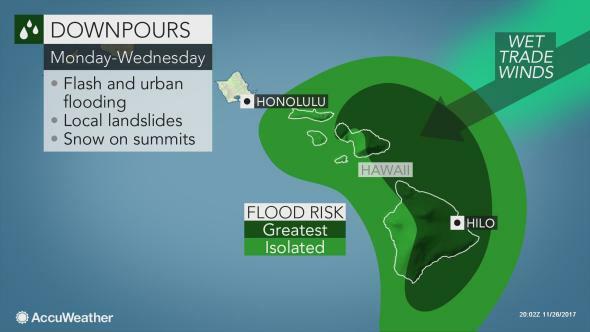 “The first round of heavy rainfall is expected on Monday and Tuesday, with torrential downpours focusing on the Big Island and Maui,” AccuWeather meteorologist Faith Eherts said. Stronger-than-normal northeasterly trade winds will blow across the islands and up the windward slopes, and by combining with the deep tropical moisture will lead to very heavy rainfall. “Rainfall rates of up to 2 inches per hour can result in dangerous flash flooding as well as landslides, which could topple trees and power lines and block or wash out roads,” Eherts warned. Rainfall amounts of 3 to 6 inches are expected for Hilo and other windward coastal areas into the midweek, with higher amounts farther inland across the Big Island and Maui. It will be cold enough across the summits of Maunakea and Mauna Loa for heavy snowfall during this time. A few inches are expected with localized amounts of up to a foot possible. Hikers will need to be vigilant and keep a close eye on weather conditions. While rainfall amounts will be less on the leeward side of the islands, moisture may wrap around at times and lead to heavier showers. Moloka‘i, Oʻahu and Kauaʻi will miss out on the heaviest rain, but a slight uptick in moisture will still bring more numerous and enhanced trade showers over the next few days. Northeastward-facing coasts will face elevated surf this week thanks to the strong trade winds. Occasional wind gusts of 30 to 40 mph will also occur. The first part of the week will be very wet across some of the Hawaiian Islands, but the second half of the week and into the weekend could be just as wet, if not wetter. Deep tropical moisture will remain strung out over Hawaiʻi and there are indications that an area of low pressure could develop in the area by Friday. If this were to occur, there could be widespread enhanced showers for some or even all of the islands. “Another round of heavy rain would exacerbate any existing flooding or bring new flooding problems to the other islands,” Eherts said. The Hawaiʻi Fire Department has confirmed that two people lost their lives on Saturday, Nov. 25, 2017, near Rainbow Falls. Four people went swimming above Rainbow Falls and two of them got swept away. One female victim was rescued at the base of Rainbow Falls and a search continues for the male victim. The fire chief who was on hand on Sunday, Nov. 26, at Rainbow Falls, believes that they were tourists from the mainland. 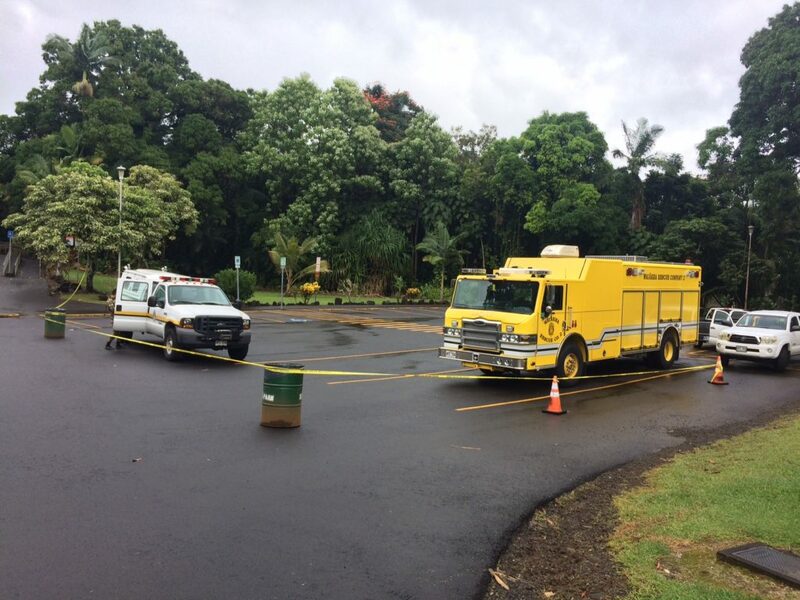 Saturday, The Hawai‘i Fire Department arrived 12:40 p.m., and within the first 10 to 15 minutes, witnesses reported that a man and a woman were having difficulty swimming in a pond above of Rainbow Falls. The two were seen going under and not seen again. The female was found unconscious in the water below Rainbow Falls yesterday. Today, an aerial, ground and dive search continued in the pond and areas upstream of Rainbow Falls for the missing male but no body has been found. The Nimitz Strike Group (CSG 11) arrived in Pearl Harbor Nov. 25 following a six-month deployment to the Arabian Gulf in support of Operation Inherent Resolve. The strike group, along with the air wing and strike group staff, departed San Diego for a regularly scheduled deployment June 5. The strike group consists of Nimitz-class aircraft carrier USS Nimitz (CVN 68), Carrier Air Wing (CVW) 11, Destroyer Squadron (DESRON) 9, Ticonderoga-class guided-missile cruiser USS Princeton (CG 59), and Arleigh Burke-class guided-missile destroyers USS Howard (DDG 83), USS Shoup (DDG 86), USS Kidd (DDG 100), and USS Pinckney (DDG 91). CVW-11 consists of Lemoore, California-based Strike Fighter Squadron (VFA) 147, VFA 154, VFA 146, Whidbey Island, Washington-based Electronic Attack Squadron (VAQ) 142, Norfolk-based Airborne Early Warning Squadron (VAW) 121, and San Diego-based Marine Fighter Attack Squadron (VMFA) 323, Helicopter Sea Combat Squadron (HSC) 8, Helicopter Maritime Strike Squadron (HSM) 75 and Fleet Logistics Support Squadron (VRC) 30. The strike group sailed more than 78,000 miles during the deployment (equivalent to approximately five times around the world), flew 1,322 combat sorties into Iraq and Syria, and dropped 904 pieces of ordnance. The strike group conducted training and operations with the French Marine Nationale, Indian Navy, the Japan Maritime Self-Defense Force, Republic of Korea Navy, Royal Australian Navy, the United Kingdom’s Royal Navy, and Royal New Zealand Navy. These included Malabar 17 in the Indian Ocean, Intrepid Sentinel in the Gulf of Oman, and landmark Three-Carrier Strike Force Operations in the Western Pacific. In addition, the strike group conducted visit, board, search and seizure drills, close-in coordinated maneuvers, flag hoisting drills, sea surveillance, replenishments-at- sea, maritime patrol and reconnaissance, explosive ordnance disposal operations, and air, surface, and anti-submarine warfare training. Over the six-month span, the strike group conducted port visits in Pearl Harbor, Hawaii; Colombo, Sri Lanka; Chennai, India; Manama, Bahrain; Abu Dhabi, United Arab Emirates; Dubai, United Arab Emirates; Hamad, Qatar; Duqm, Oman; Pattaya, Thailand; and Sasebo, Japan. Sailors participated in numerous volunteer events, including interacting with children at schools, visiting patients at hospitals, and socializing with animals at shelters. Pinckney Sailors also participated in the Association of Southeast Asian Nations 50 th anniversary celebration in Thailand, which included an International Fleet Review, conferences, and a parade. Nimitz Strike Group is part of U.S. 3rd Fleet, which leads naval forces in the Pacific and provides the realistic, relevant training necessary for an effective global Navy. U.S. 3rd Fleet constantly coordinates with U.S. 7th Fleet to plan and execute missions based on their complementary strengths to promote ongoing peace, security, and stability throughout the entire Pacific theater of operations.